We use a variety of small equipment in our classes, the Pilates circle, resistance bands, chi balls, foam rollers, hand and ankle weights, straps and aero bars. To get you back into shape after your pregnancy our Mum’s and Bub’s Pilates classes focus on regaining core strength and pelvic stability, with the convenience of having bub by your side. Soak up the ocean views at our spectacular SurfClub locations. Pilates to energise mind and body! 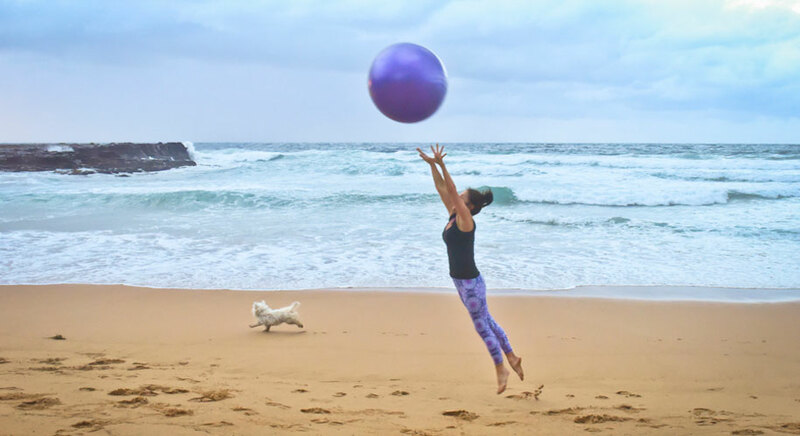 Michelle a University graduate in the Pilates Method and husband Simon are offering classes for all fitness levels throughout the Central Coast. Since commencing classes in 2001 at North Avoca Surf Club the business has expanded to 5 venues with both daytime and evening classes available. Classes are complemented with an energizing backdrop of breathtaking ocean views and in Summer cool ocean breezes. Michelle’s Pilates Place offers 4 specific class levels, allowing effective progression from Beginner to Intermediate or Advanced levels. Mum’s and Bub’s classes are also available, offering Mum’s the convenience of exercising with their young babies. Participants are taught in a progressive style, bringing an awareness and understanding of The Pilates Method. The classes are designed to improve core strength, joint and spine mobility, muscle tone and flexibility without putting stress or strain on the body. Michelle and Simon’s clients have also found Pilates an effective way to reduce stress, especially in such a peaceful environment. We also run classes at schools and colleges for staff and pupils and workplace pilates classes for office workers, with most of us leading more sedentary lifestyles these days we can all benefit from increased flexibility, core strength and help in developing a strong healthy posture. Stretch, Strengthen and Energise with Pilates! Private Pilates reformer equipped studio is now open for individual sessions. Private and semi-private studio sessions are available. Central Coast Pilates popularity continues to grow as participants enjoy benefits for both mind and body. Selected Health Funds are also encouraging Pilates, offering their client rebates. This season stretch, strengthen and energise your body, all with an ocean view. I love coming to Michelle and Simon’s Pilates classes. I walk into class my lower back tight and body feeling wound up and unbalanced after a day at the office. I leave an hour later relaxed , unwound , my muscles stretched and strengthened, my body feeling balanced again and the ocean backdrop and cool sea breezes in the summer are sensational, my favourite hour of the week ! Gift vouchers available : Great gift for Christmas/Birthdays.